Laparoscopic gastrectomy using ultrasonic devices occasionally causes postoperative pancreatic fistula. 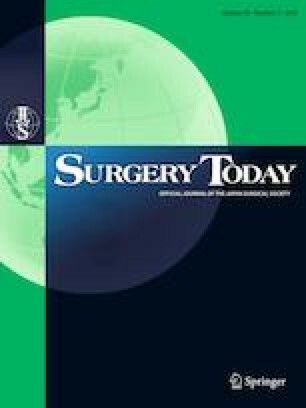 Robotic gastrectomy using monopolar scissors may reduce intraoperative injury to the pancreas. We evaluated the safety and feasibility of robotic gastrectomy. A multicenter prospective study was conducted to evaluate the surgical outcomes of robotic gastrectomy. The primary endpoints were the incidence of intraoperative and postoperative complications and operative mortality. A total of 115 patients were enrolled. The clinical T stages were T1 in 68 patients and T2 or higher in 47 patients. The types of surgery included distal gastrectomy (n = 72), total gastrectomy (n = 39), and proximal gastrectomy (n = 4). Two patients developed intraoperative complications (1.7%), but no cases required conversion to open surgery. The amylase concentration in drainage fluid was higher in cases with pancreatic compression, especially in those with compression for longer than 20 min. Postoperative complications of Clavien–Dindo grade ≥ II occurred in 11 patients (9.6%). There was no mortality. A multivariate analysis indicated that a high body mass index and pancreatic compression by an assistant for longer than 20 min were independent risk factors for postoperative complications (P = 0.029 and P = 0.010). Robotic gastrectomy using monopolar scissors is safe and feasible. Robotic dissection without compression of the pancreas may reduce postoperative complications. The online version of this article ( https://doi.org/10.1007/s00595-019-01802-z) contains supplementary material, which is available to authorized users. OH contributed to the conception, data acquisition, analysis, and writing the manuscript. OK contributed to the conception, data acquisition, analysis, interpretation of data, and revision. MK contributed to the data acquisition. TS, TE, HS, and SY contributed to the interpretation of data and revision. This work was supported by operating support grants from Kyoto University.